A member of Torretto’s crew takes a leap of faith. If anyone goes into Fast and Furious 6 looking for dramatic nuance and meditations on the nature of life and death, they’ll leave sorely disappointed. But that’s not what’s kept this racing franchise putting the pedal to the metal at the box office for over ten years. No, the driving force behind the Fast and Furious series is simply the high-octane, no-frills thrill of the chase, and audiences after that “wow”-factor will leave this latest installment wholly satisfied. “Ride or die,” says ex-con protagonist Dom Torretto. “Hell, yeah,” I reply. After the exhilarating, Rio-wrecking climax of Fast Five, during which Torretto (the aptly named Vin Diesel) and his crew made off with $100 million from a corrupt businessman, the crew is laying low. FBI agent-turned-fugitive Brian O’Conner (Paul Walker) has settled down with Torretto’s sister Mia (Jordana Brewster) and started a family, while Torretto is living it up in some tropical paradise. 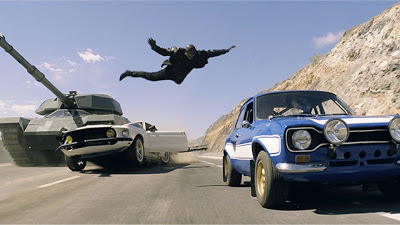 Both are drawn out of hiding when DSS agent Luke Hobbs (Dwayne ‘The Rock’ Johnson), their adversary in Fast Five, offers full amnesty to the crew in exchange for their assistance in taking down rogue soldier Owen Shaw (Luke Evans) and his crew, which includes Torretto’s presumed-dead lover Letty (Michelle Rodriguez). Get it? Got it? Good. This globe-trotting plot works spectacularly, keeping a breakneck pace while smartly moving the franchise away from its street-racing origins. Fast and Furious 6 doesn’t waste any time getting its characters into cars, because director Justin LIn knows exactly what moviegoers came to see, and he gives it to them in spades. A London-set car chase early in the film is all kinds of crazy fun, with cars flipping, guns blazing, and explosions galore. And it just gets bigger and better from there. Rodriguez and MMA fighter Gina Carano throw down in a harrowing subway-set brawl both brutal and invigorating. A Spanish highway becomes a battleground as the crew takes on a tank-toting Shaw, who crushes passing cars and blows up bridges with psychotic glee. And the film’s climax, as the crews clash on and alongside a moving cargo-jet, is a dizzying, hell-for-leather, no-brains-attached masterpiece of action blockbuster. Fast and Furious 6‘s real stars are the sleek speed machines that the actors operate, but the human actors still turn in solid performances. Everyone is clearly having a blast (though Walker is still wooden as ever), and Evans is a terrific villain, both ruthless and devious. Carano is also a great addition, putting her MMA skills to use while giving the male demographic yet another reason to buy a ticket. Torretto takes every opportunity to call his crew a “family” during the film, and that’s really what they are. Everyone fits together like parts of an engine, and almost every character gets a moment in the spotlight. We love this crew and their near-suicidal antics, and they’re a big part of why, six films in, this franchise is hotter than ever. This entry was posted in Reviews and tagged action, dwayne the rock johnson, fast and furious, fast and furious 6, paul walker, review, summer, vin diesel. Bookmark the permalink.